The Hylotl are one of the seven playable races in Starbound, and one of the six races entrusted with an Ancient artifact. The Hylotl are a semi-aquatic race with trinocular vision, highly-adaptable genetics and a relatively short lifespan, which over the generations has led them from being a strictly land-based species to one that can live comfortably in aquatic environments, though they still lack the ability to breathe underwater. They have a long and rich history of art, science, and philosophy, with reverence for tradition and meditation. Despite their highly-advanced technological level, most of their structures are still made of wood bedecked with ornate carvings. This leads to an interesting clash of Hylotl cultures in their massive underwater cities, with hand-painted calligraphy next to bright neon signs advertising the latest fashions, and quiet paper-walled garden rooms not far from the heavy bass thumping of a "bubbstep" dance club. 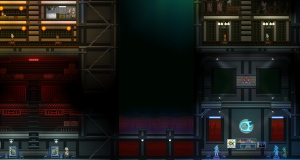 The Hylotl-owned Letheia Corporation is one of the largest companies in the galaxy, providing everything from entertainment to space stations and starship fuel to people across the stars. Hylotl pride themselves on seeking peaceful solutions to problems, though they recognize that sometimes their side of a philosophical debate on the merits of not dying carries a little more weight when backed up with a sharp enough blade. Thus, the ability to use weapons with skill and proficiency is similarly a fine-honed art passed down through the generations. Some find the Hylotl to be stuffy, arrogant, and passive-aggressive, which the Hylotl deny and figure you'll see the error of your ways once you've become a bit more enlightened like they have. The Hylotl have a long and ugly history with the Floran. Though the "why" and "how" has been lost to history, the two races were effectively at war with each other for a long time. It was a war the Hylotl fared poorly in even with their advanced technology, as a massive Floran invasion of their homeworld forced the Hylotl to settle under the oceans. Though open hostilities have been over for a long time, there is still plenty of animosity between the two races, though the average Hylotl will claim there really isn't and they've totally forgiven the Floran for being a bunch of bloodthirsty murderous brain-dead savages. As with the other player races, Hylotl characters are given a set of uniquely-styled Armors, their own Ship type (with included Pet), and two unique Mech bodies. The Hylotl equipment mixes feudal Japanese styling with aquatic themes, though their stats are the same for all other race's equipment at the same Tier. A Hylotl player has four sets of race-specific Starter Clothing to choose from in the Character Creator, plus the standard-issue Protectorate T-Shirt and Protectorate Vest. These items have no defensive capabilities whatsoever. These four sets are also used to clothe randomly-generated Hylotl NPC villagers. These sets can also be crafted at the Spinning Wheel and Sewing Machine. There are a number of Hylotl-related Cosmetic Armors to be found scattered across the universe, usually in Hylotl-themed Dungeons, but sometimes in random/Biome chests. Like the Starter Clothing, these have no defensive capabilities, but let the player customize their character's appearance. The Hylotl Ship is sleek as an ocean fish, with "dorsal" fins and smooth curves. Its size can be expanded by obtaining more Crew members, which allows the player to buy a higher-class Ship Licence from Penguin Pete for every two more Crew members. Alternately, the player can buy counterfeit licenses from Penguin Bay: these licenses are expensive, but do not have crew requirements attached to them. Once upgraded to the Condor Class (the largest Ship class), the Hylotl ship takes on a more whale-like appearance, albeit a whale with a lot of back-fins. Hylotl ship pets are three-eyed Crabs, coming in one of ten different colors/patterns chosen at random. Hylotl player-characters have the ability to craft two unique Mech body types. The Kabuto-00 Mech Body is the first Mech body the player will obtain, by completing Dr. Akaggy's "Test Drive" quest at the Outpost and unlocking the ability to use Mechs. Its advanced version, the Kabuto Mech Body, is obtained by completing Akaggy's later "Advanced Test Drive" quest. Hylotl NPCs are very common. Lone Hylotl Merchants can pop up on nearly any world (both through normal planetary generation and temporarily as part of a Quest), and spaceships and space stations may have Hylotl crew. Hylotl will often appear as NPCs in mixed-race planetary Microdungeons such as Savannah settlements or Tundra science stations. Hylotl houses are also the only Microdungeons to appear on the islands of Ocean planets. Hylotl surface villages and dungeons can be found on all planet types that can have surface-level full-sized dungeons except for Lush (aka "starter") planets. These structures do not have a "favored" planet type. The Hylotl are the only race to have full-sized villages and dungeons on Ocean planets, at the ocean floor. The underwater cities are currently the only planetary structures to be protected by a Shield Generator to prevent the player from removing items and blocks, though the Generator can be switched off once found. The Quest to find the Hylotl Artifact is the second of the five Artifact Quests the player must undertake. This two-part hunt first involves finding Hylotl decor items and scanning them, giving Esther data to locate the Artifact's whereabouts. Once she has enough data, the player can travel directly to the Grand Pagoda Library to retrieve it, where the player has their first encounter with the Occasus Cult leader Asra Nox. Once the Hylotl Artifact has been obtained, Koichi will set up camp at the Outpost near the Ark. Over the course of the game, he will ask the player to obtain certain decor items he wants to fill out his museum. Finishing up this string of quests rewards the player with the unique Hokucide sword. A variety of Hylotl Tenants can be summoned by placing a Colony Deed in a suitably-furnished room. These Tenants will always be Hylotl regardless of whatever racial furniture is placed in the room, with two exceptions. The Naturalist Merchant has a 50/50 chance of being a Hylotl or a Floran, while the Scientist may be a Hylotl, Human or Apex. Hylotl feature in a good number of Codex books, both written by Hylotl and by other races. The player can find fossilized remains of Hylotl underground on most planets by successfully completing a fossil mini-game. The prizes for completion are randomized, so it may take a lot of tries to obtain even a single piece. Once a complete set of skull, torso and legs has been collected, they can be placed in a Medium Fossil Display, forming a complete Hylotl skeleton to be put on display as a decor item. This also completes entry #13 in the Fossil Collections Library. Once the skeleton and display have been combined, they cannot be disassembled. The player may also find the Hylotl Skull Mask Cosmetic Armor piece in Bone Chests scattered throughout Bone Biomes. The Hylotl have changed very little over the game's development, primarily due to being the last of the original six player races to be "fully" implemented into the game. Throughout most of Beta development there were no Hylotl villages or dungeons at all and little Lore about them in specific, with the bulk of their content added during the late-stage "Giraffe" updates. The Hylotl race is based on the Axolotl, an amphibian salamander found in Mexico. The Hylotl Flag bears a striking resemblance to the Japanese flag, except with three dots (as the Hylotl have three eyes) instead of one. It is thought by many players that the Hylotls may have thought to exterminate the Floran race in some way because of their violent culture, but failed when they tried, so the Florans retaliated on the Hylotl homeworld. Others think it could have, instead of being an extermination, been "an Ultron event", which is where another race will try to restart the other's evolution to make something better by exterminating most of their kind. There is slight evidence to back up the fact that the Hylotls would try this, as seen in Never Invite a Novakid to Tea and other codexes that show how they try to "fix" and "perfect" other races just because they're different than theirs. This page was last modified on 25 February 2019, at 03:24.